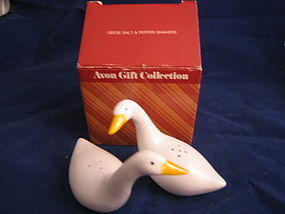 Geese salt and pepper shaker with box. They have not been used and show no damage. The box shows age wear. I need your zip code to calculate the postage. 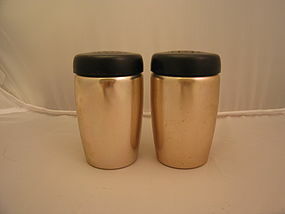 Vintage copper finished aluminum salt and pepper shakers. These are the plain style without graphics. They measure 4 inches in height. There are no dents or dings, however, they have usage and cleaning marks to the surface. The lids show no damage, other a bit of cleaning marks. 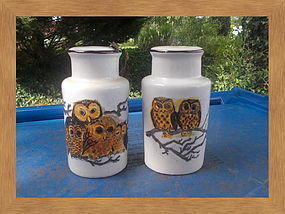 They are worth the price, just to have the lids, as this style lid would split or crack. I need your zip code to calculate the postage. 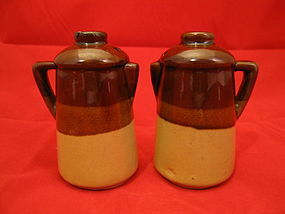 Vintage set of coffee pot salt and pepper shakers in what looks like 3 toned brown and tan pottery. 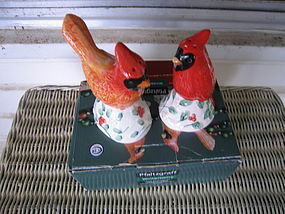 I am not sure if this is actually pottery or pottery finished redware. I have a photo of the unglazed bottom rim, which will give you an idea of the material. They measure 3 3/4 inches in height. They have the original stoppers and show no damage, however, there are several manufacturing flaws. Additional photos by email. I need your zip code to calculate the postage. 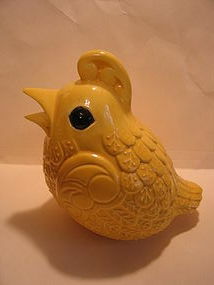 Vintage yellow quail shaker. 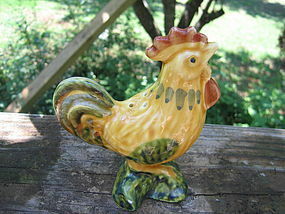 It is 5 inches in height and 4 inches in width. Due to the size, I've wondered if it is a muffineer. There are 4 shaker holes. The rubber stopper is in place. 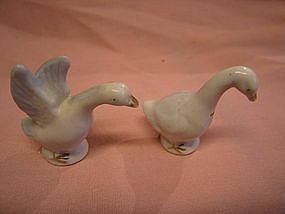 There several tiny flakes (tail and beak). It is available in green. I need your zip code to calculate the postage. I really don't know much about this shaker and could find no information. The bottom is marked Allegro 15. The glass jar is an octagon shape. 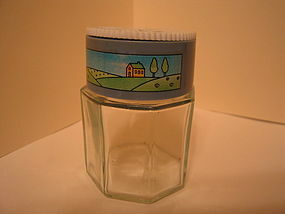 The lid is plastic and decorated with houses, hills and trees. it is 3 3/8 inches in height. I'm not sure if it is the salt or pepper, but has 11 holes. The plastic lid shows superficial usage wear. I need your zip code to calculate the postage. Vintage porcelain set marked Japan in red. They are a tiny size of 1 3/4 inches in height. They are so small that I've wondered if they were part of an individual shaker set. They are white, but the photo doesn't show the faint blush of pale blue on the wings. The pepper still has the original cork stopper, but it is in the shaker. There is age related wear to the gold accents. I need your zip code to calculate the postage. Set of plastic shakers measuring 2 x 1 1/4 inches. They are marked St. Labre Indian School. There is no damage. I need your zip code to calculate the postage. 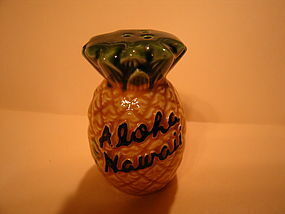 The shape of this shaker always reminded me of a pagoda, however, I think it was intended to look like a genie bottle. 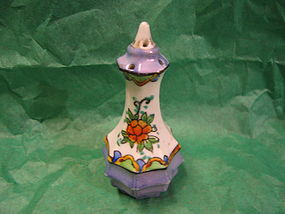 The base is an iridescent blue and has a handpainted orange flower. I am not sure if this is the salt or pepper - there are 2 rows of holes, with 4 on bottom row and 3 on top row. It is almost 4 inches in height. The bottom is backstamped in old black Japan. The cork is in the bottle. I need your zip code to calculate the postage. Pepper shaker measuring 5 1/8 inches in height. It was manufactured in Japan. 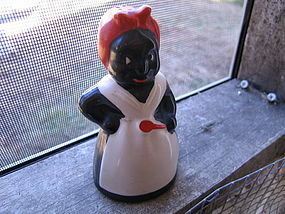 I've never understood why this one has no face, as the matching salt shaker has a molded in face - the face was not painted on, but was part of the shaker. This one only has the hair. Beginning to show age to the finish. I need your zip code to calculate the postage. 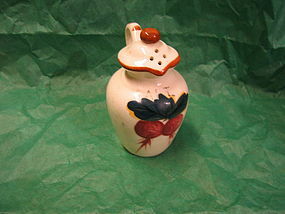 Vintage ceramic shaker manufactured in Japan. It is slightly over 5 inches in height. 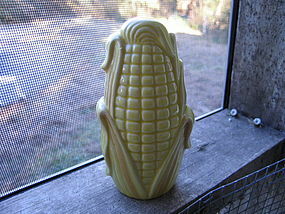 The face is part of the mold. Minor aging to the surface. I need your zip code to calculate the postage. 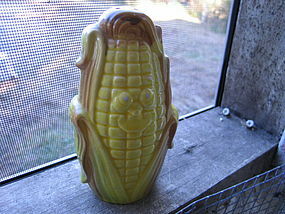 I have the matching pepper, but the mold used for it, did not have the face, only the hair. I need your zip code to calculate the postage. It is 3 1/2 inches in height. Some loss to the finish, missing stopper and needs cleaning. I need your zip code to calculate the postage. Salt shaker is available. Not sure if the salt or pepper, but has 6 holes. This is a better quality shaker than some of the Aunt Jemima shakers put out in the early 1990's. The kerchief is solid red, as opposed to the red dotted type. The height is almost 4 1/2 inches. Small loss to the finish. The stopper is missing. Additional identification pics by email. I need your zip code to calculate the postage. 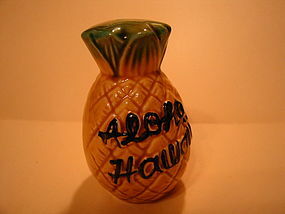 Aloha Hawaii souvenir pepper shaker. Old blue Japan sticker on bottom. No damage and still has original cork. It measures 3 1/4 inches in height. Salt shaker is available. I need your zip code to calculate the postage. 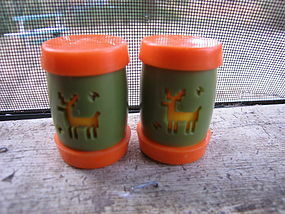 Vintage shaker manufactured in Japan. It is 3 12/4 inches in height. Has original cork. 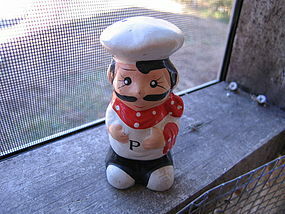 Pepper shaker is available. I need your zip code to calculate the postage.